Who said conservation can’t be creative? 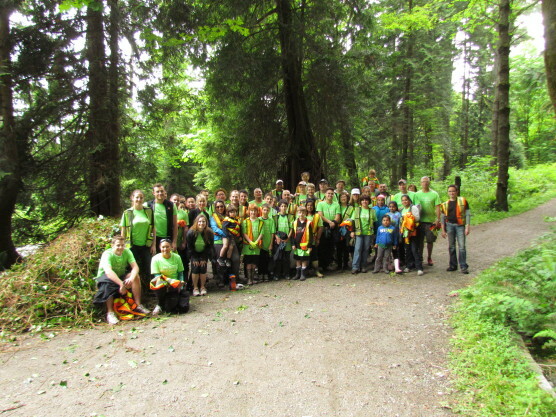 On May 26, as part of the Telus Day of Giving, 70 volunteers helped remove a huge amount of English ivy, a nasty invasive species encroaching on the native plants in the forest near Third Beach. And, then this past weekend some of the invasive plant material removed was repurposed into something that could actually help the forest. Bio-netting made from English ivy vines will be used as erosion control on restoration sites in the Park. Passersby visitors were given the chance to help us develop bio-netting by crocheting the vines of the English ivy using the fence on top of the Nature House as a crochet hook. The creative brain behind this project is local artist Sharon Kallis, who specializes in creating artwork from natural materials. The bio-netting created over the weekend will be hung to dry to ensure the plant material is dead and will not re-root. Installation is scheduled for early October. Thanks to all who removed the English ivy and to those who participated in the crocheting! Together we showed the world that conservation can be a creative art! Stay tuned for installation updates.